Thanks for visiting. My mission is to help your employees and their families avoid accidents, particularly serious ones. You will find links below to download a Word file and a PDF file of the Reproducible Articles at no charge. Also, your employees may download complimentary copies of my books. See the link below. You may print and use any of the pages that will help you, your employees, and your loved ones develop Personal Safety Plans and lead safer lives. I encourage you to share this website address with others. If this information proves helpful and you wish to make a contribution to defray the expenses of this website and publishing effort, please send a check for any amount payable to Safety Times to the address below. Help You Reduce On-The-Job And Off-The-Job Accidents? Off-The-Job safety have lower workplace injury/illness rates." which results in fewer on-the-job accidents. turn on when they come to work. 1. Reduce your workers' comp cases. 2. Increase your productivity and profits. 3. Help your employees and their families avoid accidents, particularly serious accidents. ● Use the articles or excerpts in your publications, bulletins, or paycheck inserts. ● You may make as many copies of the Reproducible Articles as you wish for safety meetings, bulletin boards, etc. You may add your logo. Encourage employees to share the safety tips with their families. ● Use the 129 articles and 3,000+ safety tips to send e-mails to employees to build safety awareness and 24-hour safety attitudes. ● You may set up a website of the articles so employees can access off-the-job safety tips. For example, the driving articles will help parents with teenage drivers. ● Send the articles to other safety leaders in your organization. ● The text and illustrations are in Microsoft Word format. You can easily excerpt or modify the text and the illustrations. The articles are also available in a downloadable PDF format. The Reproducible Articles are reader-friendly. A unique feature of the Reproducible Articles is the use of light-humored illustrations and true stories to help get the points across. All it took to turn a routine April morning commute into a 98-car nightmare of wreckage and mayhem was a little rain, sudden bright sunshine, and some careless drivers. "This is a wreck that just didn't need to happen," said a spokesman for the Missouri Highway Patrol in St. Louis. "The real blame is on people driving too fast for the conditions and following each other too closely in inclement weather. Vehicles were kicking up a lot of mist and causing glare. Someone looked ahead and saw traffic backed up, hit the brakes, and then started to skid. That's how this whole mess got started." For about 40 people, the pileup ended in an emergency room. Amazingly, no one ended up in a morgue. Click Here for more ways the Safety Times Reproducible Articles will benefit you, your employees, and your company, and the background of the Reproducible Articles. Click List of Topics to see the complete list of the Articles you receive. make the Reproducible Articles interesting, relevant, and readable. copies of the articles, click this link. safety, and how it will benefit your operations. organize and implement an off-the-job safety program. 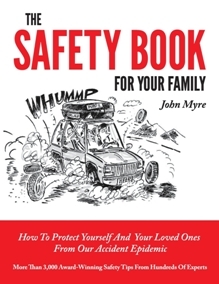 quoting the author and publisher on off-the-job safety. will further strengthen your safety programs. Thank you for visiting and for your support in reducing on-the-job and off-the-job accidents. Please tell your friends and associates about this website and our services.